One of the few living figures in the music world whose legendary reputation has entirely trancended his actual life, Bob Dylan was a central architect of the 60s folk-rock movement. In his youth he absorbed the influences of country and folk traditionalists; as a teenager, he was swept up in the excitement of early rock & roll music and began performing on piano and guitar in bands with his schoolmates. Late in 1959 Dylan enrolled in the University of Minnesota, but his love of music soon overpowered any academic ambitions and the following year, after spending a summer in Denver honing his stage persona, he dropped out and moved to New York to immerse himself in its incipient folk-revival scene. While in New York he also sought out his hero Woody Guthrie, spending as much time as he could at the ailing musicians bedside. Dylan quickly became a regular feature in Greenwich Village clubs and coffeehouses. Critical attention began to accumulate, and by 1961 he was signed to Columbia Records, releasing his eponymous debut in 1962. The record was primarily composed of versions of folk and blues standards, the singer lacking the confidence to include more than two of his own original songs, but that had changed by the following release, 1963's The Freewheelin' Bob Dylan. Dylan had begun to get involved in the Civil Rights Movement, reflected in songs such as Blowin' in the Wind and A Hard Rain's A-Gonna Fall, both of which went on to become popular anthems for the movement. 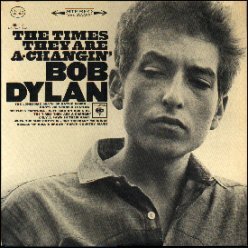 This direction was continued with 1964's The Times They Are A-Changin', the title track in particular establishing itself as another protest classic. During this time, he began a relationship with another prominent folk figure, Joan Baez; Baez made use of numerous Dylan compostions for own her albums and performances, broadening his popularity even further as a result. By 1965, Bob Dylan was eager to expand his musical approach and began integrating electric instruments into his compositions. The first recording in this style, Bringing It All Back Home, became a landmark release in what was starting to be referred to as 'folk-rock'. A folk-purist segment of his audience initially rejected the material, however, resulting in Dylan and his band being booed off the stage during his appearance at the Newport Folk Festival later that year. Despite the backlash, Dylan's popularity only continued to grow; and by the end of the year he would release what has become the most well-known album of his career, Highway 61 Revisited. By this time, the pressures associated with his success began to overcome the singer; it wasn't until after a serious motorcycle accident in 1966 that Dylan was finally given a period of respite and reflection. His subsequent musical output abandoned the rock flourishes in favor of restrained, country-oriented material. A steady decline in public and critical support accompanied the shift. In 1972, he made his acting debut in the film Pat Garrett and Billy the Kid and managed to restore some of his diminishing popularity with his song for the film's soundtrack Knockin' On Heaven's Door. A change was made from Columbia to Asylum Records, and with 1974's Planet Waves (recorded with The Band) and 1975's Blood on the Tracks, Dylan was once again at the top the charts. Bob Dylan's subsequent career has followed this pattern of decline and return. His late 70s/early 80s born-again Christian material precipitated another dip in his career (although he did earn his first Grammy for 1979's Slow Train Coming). A Mark Knopfler-produced return-to-Judaism release Infidels in 1983 and late-80s membership in the all-star band The Traveling Wilburys brought him up out of it again, with several peaks and valleys in-between. 1989's Oh Mercy was largely hailed as a return to form and 1990's Under the Red Sky was largely poo-pooed. The early years of 2000 have seen the singer's reputation once again on the climb. Between the superhuman legend which will forever be clinging to his back and the mumbling caricature of himself that for some he has devolved into, opinion on Bob Dylan will no doubt remain polarized between reverence and dismissal. Born Jewish, he became a Born Again Christian in the 1970s but is no longer such. As of 1997, Dylan "subscribes to no organized religion" (John Pareles, New York Times News Service), but attends many Jewish services and events. Dylan was at his son's 1982 Bar Mitzvah, participated in a 1988 Chabad telethon, and spent his 2001 Yom Kippur at a Chabad center in Encino. Chabad is a hasidic sect of Orthodox Judaism originating in Brooklyn. See Debra Rubin, "Bringing Bob All Back Home", New Jersey Jewish News, 2 June 2007. "No one really knows what Dylan is. But I know he did attend Yom Kippur services on Long Island last year  so we think he has returned to the faith of his father."